GO HAWKS! 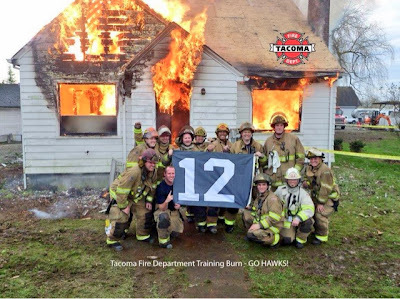 From your fans at Tacoma Fire Department. Narrative: At 7:19 pm, Firefighters from Stations 1,2,8,9,11,12 and 14 responded to a reported residential house fire. Initially dispatched as a single engine company response, the first arriving company found heavy smoke and flames showing from the approximately 1,200 square foot one-story house. The incident commander quickly upgraded the incident to a full fire response, bringing additional resources on-scene to battle the well-entrenched blaze. Crews mounted an aggressive interior attack, ventilated the structure, and conducted a search to confirm no one was trapped inside the vacant house undergoing renovation. Fire investigators were unable to determine the cause of the fire that appeared to have started in a bedroom area. Damage estimates are $160,000 to the building and its contents and the house is considered a total loss. The Tacoma Fire Department has received notification that they have been awarded $3.4 million from the Staffing for Adequate Fire and Emergency Response (SAFER) program. The grant would provide funding for up to 20 existing front-line firefighter positions for two years. According to Fire Chief Jim Duggan, should the City Council accept the award, the department would hire and train the new firefighters this spring. In accordance with the grant’s requirements, the new firefighters would replace firefighters who have recently retired or who have officially notified the department they will be retiring later this spring. An annual event since 2003, Tacoma Fire Department takes great pride in supporting our local YWCA Women's Shelter. Firefighters and YWCA staff created a human supply chain to unload and stock thousands of pounds of non-perishable staples, toiletries and infant care items that TFD employees donated to help support program participants in the coming months.